A brand new track day company, Classic American Muscle, is delighted to announce the launch of its unique Mustang Experience package allowing members of the public to get behind the wheel of fully restored, track-ready vintage American V8 Ford Mustangs and drive at high speed around a choice of UK race tracks. For just £249, aspiring drivers can live the American dream and feel the raw power of these iconic cars with a three hour Mustang Experience, piloting up to four classic Mustangs, each with their own personalities and specifications. 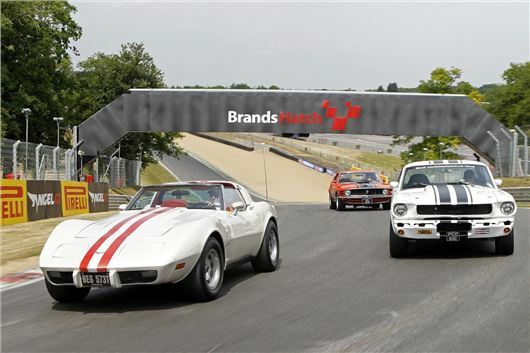 Alternatively, for £199, Classic American Muscle offers a 10-mile Classic Mustang Experience, putting you behind the wheel of one of the company's vintage Mustangs for 10 miles of the circuit. Classic American Muscle operates a fleet of vintage Ford Mustangs including 'Hercules' a high spec 1965 Mustang Coupé; 'Ruby' a 1965 Coupé with an engine originally built for straight line drag racing, 'Sprint' a 1970 Boss 302 Tribute and 'Flo' a 1995 Ford Mustang GT. For those who want to feel the thrill of a classic muscle car but would rather leave the driving to the professionals, passenger experiences are also available for just £29.99 for three laps of the racetrack at top speed with one of C.A.M's (Classic American Muscle's) professional ARDS drivers at the wheel of either a vintage Mustang or Corvette Stingray. Offering everyone a taste of Classic American Muscle, the first 150 people in July to register here http://www.classicamericanmuscle.co.uk/free-hot-ride , can claim a free of charge, high speed passenger lap in a vintage muscle car at the hands of C.A.M's chief instructor and four time Jaguar XJS Champion, Stewert Lyddall. "We wanted people to experience the raw driving thrills these fantastic cars offer," said Ant Webb, Director of Classic American Muscle. "With our unique and affordable driving packages, thrill seekers and enthusiasts alike can get behind the wheel of vintage Mustangs and experience aggressive suspension systems, high performance braking and growling V8 engines with true horse power. This is a track day to remember!" The Ford Mustang is one of the most legendary American muscle cars of all time and has been an eye-catching fixture on U.S highways since 1964 - the model celebrates its 50th anniversary in 2014. A star of the big screen, the Ford Mustang has provided the four wheel thrills alongside Steve McQueen in Bullitt (1968), Nicolas Cage in Gone in Sixty Seconds (2000) and Will Smith in I Am Legend (2007) amongst many others. 1965 Ford Mustang Coupé ' Hercules' * 302 high spec V8 * Performance Camshaft * Aluminium Pistons * High Rise inlet manifold * Edelbrock four barrel carb * Electronic ignition * Header exhaust manifolds * 2 ½ Twin freeflow exhaust * GT390 close ratio 4 speed toploader gearbox * GT390 performance front suspension * GT390 performance rear suspension * Disc brake conversion Plus a full body rebuild, respray and livery. 1995 Ford Mustang GT 'Flo' Our Mustang GT 4.6 V8 with 5 speed manual gearbox is a standard 4.6 GT that we have stripped out to a bare car. The exhaust tone is sharp and super responsive thanks to her fuel injection system. The Mustang GT was reintroduced for 1994, featuring higher performance and better handling than the base Mustang or its 1993 predecessor. Mustang GTs could deliver zero to 60 mph in the mid-six second range and complete a quarter mile in about 15 seconds. The Mustang GT also featured a stiffer handling suspension. The 1994 Mustang GT was named Motor Trend Car of the Year. 1979 Corvette Stingray C4 John Greenwood is a former racing champion who went on to build custom racing and street Corvettes. From 1975 to 1981, Greenwood upgraded the C3-chassis Corvette. From 1984 to 1996, he modified the C4 Corvette, and from 1997 to 2004. Our C4 is a genuine Greenwood Corvette capable of sub-60 second laps at Brands Hatch Indy, making it the quickest car in our fleet. It's a rare manual gearbox model, with limited slip diff and super deep exhaust which sets her apart from standard Corvette C4 models.